I studied the long wiggly squiggly line on the map and thought, that’s a trail I need to hike. There were twists and turns aplenty but all with a clear aim. 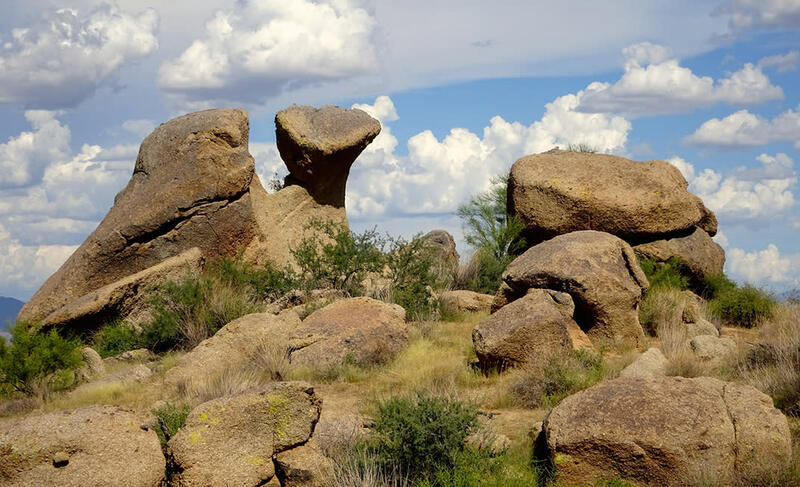 For 7 miles the Gooseneck Trail flows in long sinuous curves carving a direct route through the central region of Scottsdale’s McDowell Sonoran Preserve. 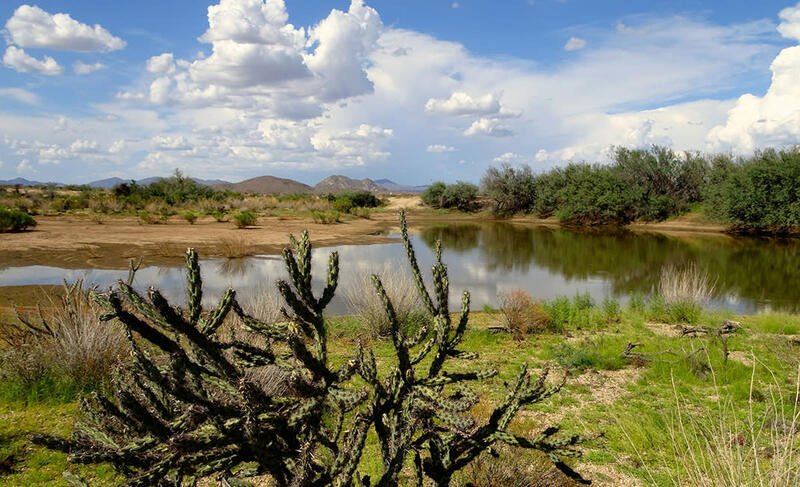 Most of the preserve’s 30,000 acres are spread across the broad northern and southern regions with their scenic blends of rugged mountains and desert plains. But the slender pipeline of the central section is what knits them together. Gooseneck serves as the main artery and I wondered what secrets it held. On a warm September day I started from the Fraesfield Trailhead. The first 0.8 miles of Gooseneck ambles west, parallel to Dynamite Boulevard/Rio Verde Road. There are nice cloud-shadowed hills to the north but mostly this stretch gives you a chance to limber up. The trail crosses the road at 128th Street and heads due south for the next 2.2 miles. Soon, as traffic noise fades, things get interesting. The trail begins to weave through creosote flats sprinkled with clusters of oddly stacked boulders. The hunks of granite first catch my attention, lots of angles and textures, but I’m soon studying the surrounding greenery. 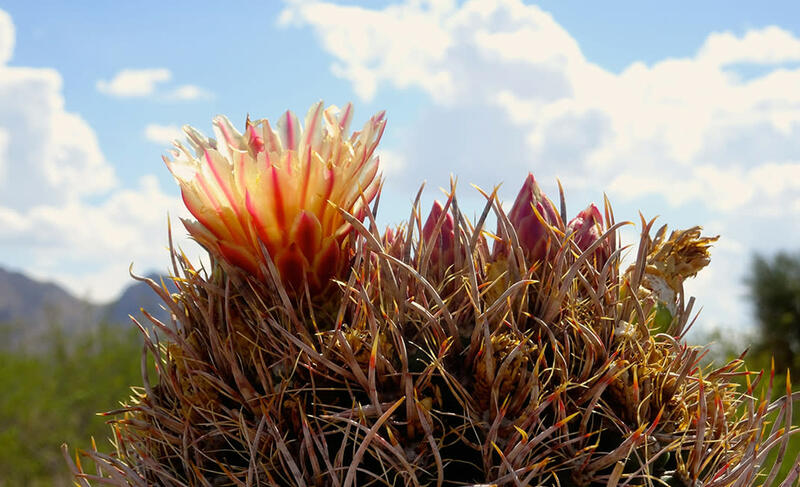 The creosote is one of the desert’s hardiest plants, sinking roots where even cactus fears to grow. The shrubs are an explosion of spindly branches sporting small waxy leaves and a spray of yellow flowers. There always seems to be an unruly madness about them. Yet they have a special gift. They turn water into perfume. It’s creosote that releases the sweetly pungent fragrance whenever it rains in the desert. No aroma is as haunting or evocative to a desert dweller. A thousand memories come wafting back, each happier than the last, when we smell creosote holding handfuls of rain. And along this portion of the Gooseneck Trail are some of the most robust creosote plants I’ve ever seen, many growing more than 7 feet tall like a thin forest. All I could think was that I desperately needed to hike this trail again on a drizzly dreamy day. At 1.6 miles I pass the turnoff for Redbird Trail. As is the case at virtually all trail junctions in McDowell Sonoran Preserve, a posted sign includes directional arrows, mileages and coordinates (GN5 here). The coordinates pinpoint your location if you need to call for help or, in the future, a pizza. At least that’s my hope. In another mile I stumble onto something wonderful and unexpected. Soon as the trail crosses a service road, I’m gazing at middle-of-nowhere water. A genuine pond fills a shallow basin, no doubt a stock tank from ranching days lapping against a berm lined with mesquite trees. This mirage-come-to-life serves as a reminder that sweet-scented rain does fall in the desert, and I wasn’t the only one celebrating our abundance. Butterflies danced at the water’s edge, dragonflies skimmed across the surface and a flock of swifts performed aerial acrobatics. I was happy to linger for a while witnessing this flurry of activity. Soon after leaving the mini-lake behind, Gooseneck turns east for a mile, almost reaching the boundary of McDowell Mountain Regional Park before pointing south again. The scenery becomes more dramatic as the trail crosses low hills that roll like waves against the wall of the McDowell Mountains. Saguaros begin to gather and the clumps of boulders return, except now they’re bigger, more belligerent somehow. It’s pretty much everything you want in a desert trail. Gooseneck ends at its junction with the Rock Knob Trail near the base of the mountains. The granite spire of Tom’s Thumb is visible along the ridgeline. Bear right on Rock Knob for 0.2 miles to join the Marcus Landslide Trail, and another right (0.4 miles) to reach Tom’s Thumb Trailhead. Even though you’ll be tempted, don’t save this trail for a rainy day. You’ll find plenty of desert magic along Gooseneck no matter what the weather.